(Photo - 05) Two pleasure craft leave their white wakes as they zoom around this horseshoe-shaped island, which is about five miles away from us. (Photo - 06) From our mile high aerial view, we saw many boats cruising in the water and many more docked at these three large marinas. (Photo - 05) This is the rocky eastern end of Fisher's Island which was visible off our right wing as we flew on to Block Island. (Photo - 07) This is another passing look at Fisher's Island with a hazy view of Long Island along the horizon. (Photo - 08) This is a closer look at a portion of Fisher's Island. (Photo - 08a) This is a last look at the eastern end of Fisher's Island as we continue across the final 18 miles of open water to Block Island. 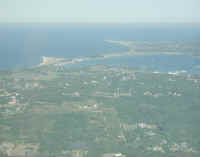 (Photo - 21) As I began the downwind leg on our approach to the Block Island Airport, Mary reached behind me to take this picture out the left side window. The basin in the middle-right of the photo is New Harbor. 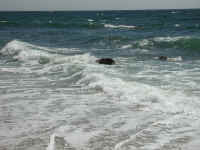 In the distance (about 12 miles away) is the coast of mainland Rhode Island. (Photo - 24) This is a closer look at the entrance to New Harbor and the distant coastline of mainland Rhode Island. (Photo - 25) As I banked the plane to the left to begin the base leg of our approach into the Block Island Airport, Mary was able to take this picture of the runway. (Photo - 29) We had decided to walk around the west side of the airport to look at Mohegan Bluffs, which we hadn't seen for many years. 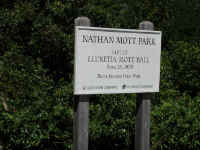 A short distance from the airport we spotted this park sign and went to take a look; but due to the drought, we didn't see much, and decided to continue our hike to the Bluffs and come back here another day. (Photo - 31) As we continued along, we spotted this pond on the west side of the road. Even though Block Island has become a summertime tourist attraction with a lot of commercialism, the residents of the Island have done a wonderful job of preserving the natural beauty. 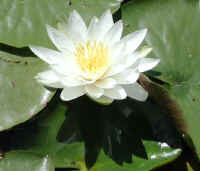 (Photo - 31a)There is a simple yet elegant natural beauty in this pond setting, with its rocks and water lilies. (Photo - 31b) Just a short distance away are more rocks and water lilies, some of which are in bloom, and an interesting spiked plant (perhaps a blue flag iris?) 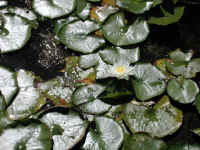 growing between the rocks to add its special character..
(Photo - 31c)Each little segment of the pond creates its own picture; all we did was digitize it in our camera so we and our friends could enjoy the beauty even when we're not on Block Island. (Photo - 32) Sometimes we think we're a little strange because we enjoy looking at these rocks around the pond, and believe that they're all part of God's created beauty. Then, as we reflect on our walks around Block Island, we realize that others must feel the same way, because almost everywhere we look there are stone walls and fences. 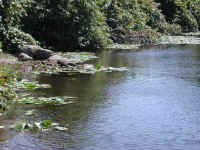 (Photo - 32a)Then we lifted our eyes from the rocks and took in more of the composite beauty of this pond. (Photo - 33) Every day, we encounter situations of cruelty and destruction that our fellow human beings have inflicted upon other people, the animals, and the environment, and it is very painful to us. It is the natural beauty of places like this, and the acts of other truly unconditionally loving and compassionate people that give us hope and the courage and enthusiasm to continue our work as peacemakers, and the faith that others will join this movement. (Photo - 34)Even as we prepare this photo journal of our excursion to Block Island, we relive that day and the the feelings of peace we felt looking at the quiet beauty of the water lilies resting upon the surface of the pond. (Photo - 35) And, without getting our feet wet, our camera helps us get a closer look at this beautiful flower. It may not be a "peace lily", but it does bring a sense of peace to our hearts, as we hope it does for others, too. (Photo - 36)We had left the previous pond and had continued our walk along the road toward Mohegan Bluffs when we came to Fresh Pond and this monument which had been erected along the side of the road. (Photo - 37) We stopped and looked across Fresh Pond, and could understand why people would want to settle here, bury their dead, and erect their churches. But standing here, we realized that we can experience the presence of God without a physical building, for it is evident in the beauty of creation. (Photo - 38)As we continued our walk, we took a final look at Fresh Pond...well, at least for this day. (Photo - 39) All along the roadside were stone walls and fences. (Photo - 39a)We particularly enjoyed the way this stone fence "rolled" with the contour of the land. (Photo - 40) As we continued along the road, this sign at a driveway entrance caught our attention. 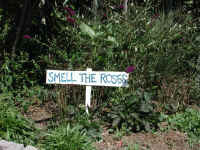 We wondered...was this a sign to tell others to slow down and take time to smell the roses, or was this their place to get away from the hecticness of life, or perhaps did it have a double meaning? (Photo - 56)Then we came to the reason for this day's excursion. (Photo - 41) This is a view of Mohegan Bluffs from near the top as we looked westward. (Photo - 41a)There is a rugged natural beauty in the cemented sands and rocks of these bluffs, and the plants that tenaciously cling to the surface. (Photo - 41b) Even from near the top of Mohegan Bluffs, we could hear the sounds of the waves of the Atlantic Ocean breaking along the shore and over the rocks. 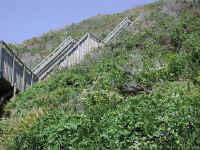 (Photo - 42)The stairs seemed to go on and on, disappearing behind some shrubbery as they twisted their way down to the beach. It was much like climbing down and up the stairs of a 20-story building. (Photo - 42a) The tide was coming in, and this "finger" of surf reaching farther up the beach than the other waves caught our attention. (Photo - 43)As we descended on the stairs, the rugged, weathered, barren bluffs stood in stark contrast to the surrounding landscape. (Photo - 43a) Like a medieval gargoyle, the end of this bluff stares out into the Atlantic Ocean. 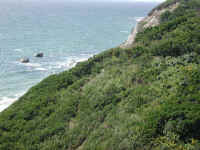 (Photo - 43b)Farther down the face of the bluff, another weather- chiseled face stares out over the Atlantic Ocean. 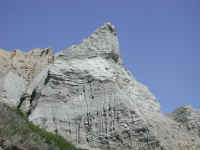 (Photo - 43c) The harder, or more firmly cemented sections of the Bluffs have stood against the winds and rains of time. In the upper left is a section that is considerably undermined. Chances are that in the not too distant future, the overhang will break loose and plummet down toward the ocean..
(Photo - 44)This is a small portion of the stairway which we had climbed down. 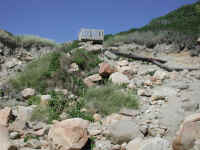 (Photo - 45) About 30 feet above the beach, the stairs end with an observation platform. From there we had to climb down rocks and 2-3 foot high log steps. On the side of the platform was this sign. 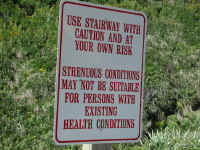 (A similar sign was posted at the beginning of the stairs.) We also noticed that we were at least 20 years older than any of the other people who climbed down to the beach. We very much appreciate the health and vitality that comes with our healthful vegan diet! (Photo - 46)This is a beach level picture of the western end of the Mohegan Bluffs. 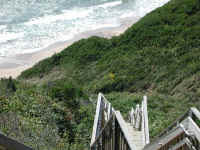 (Photo - 46a) About 30 feet above the beach, the stairs end with an observation platform. 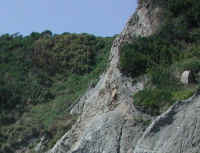 A lone house sits above this portion of the bluff. (Photo - 46b)Because the waves roll in at an angle to the beach, they cause a rolling of the sand on the beach into a stationary wave pattern. 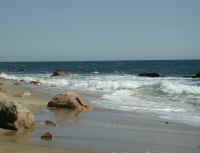 (Photo - 46c) A steady procession of waves rolled in past these rocks to break upon the beach. 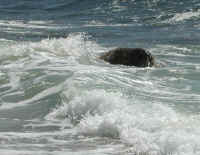 (Photo - 46d)We noticed that in this one spot, the surf foam seemed to remain in balls and float upon the waves. (Photo - 47) This is another section of the Mohegan Bluffs and beach to the west of the stairs. 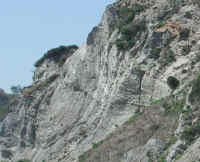 (Photo - 47a)There seems to be a wave pattern in the eroded face of this portion of the Bluffs. (Photo - 47b) Apparently, running water has created this swath cut through the vegetation on the side of the Bluffs. (Photo - 48)When we took this photo, we didn't see this adventurous climber sitting on a ledge on the face of the Bluffs. (Photo - 48a) The edge of this section of Mohegan Bluffs looks like the profile of the head of a lion surveying his domain. (Photo - 48b)We spotted this little cave entrance or pocket in the face of the bluff. Owls and sea birds nest in some of these holes. (Photo - 48c) Over time, pieces of the bluffs break off and fall down to the beach. We spotted this crack and surmised that a few freeze-thaw cycles over the winter could be enough to cause this chunk of the bluffs to fall off. (Photo - 49)This is another look at a portion of Mohegan Bluffs that towers above the beach. 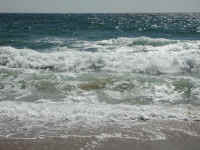 (Photo - 50)Next, we turned our camera toward the ocean to take some pictures of the breaking waves. (Photo - 50a)There is something very soothing about watching the waves coming into shore and breaking as they approach the beach. (Photo - 50b) Normally, it's hard to see below the surface of the breaking surf; but here, just before the one breaker, the water smoothes out like glass to reveal the rocks below. (Photo - 51)The colors of the breaking waves are in sharp contrast to the waters beyond. Note the way the returning water flows back into the Atlantic at right angles to the breaking surf..
(Photo - 51a) At a casual glance, each wave may look just about the same; but actually, they are unique. There are subtle differences in the way each wave breaks, the way it tosses water into the air as it rolls over, and the way it engulfs the foam pattern of the previous wave. 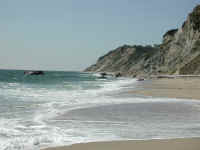 (Photo - 52) The beaches along most of Block Island's coastline have the same natural beauty as this one at the base of Mohegan Bluffs. (Photo - 52a) We thought this scene of the waves and rocks was exceptionally beautiful. Even a departing wave left just enough water to produce a reflection of the foreground rock upon the sands of the beach. 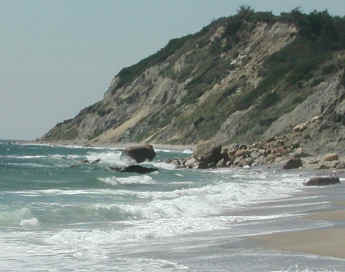 (Photo - 53) The beaches along most of Block Island's coastline have the same natural beauty as this one at the base of Mohegan Bluffs. (Photo - 54) Many of the rocks along the beach are composed of tiny crystals that are cemented together. 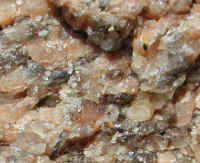 This close-up photo shows some of these crystals. (Photo - 54a) This section of the rock has various colors; of particular interest to us was the vertical line of change in color (just left of center). 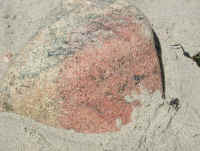 We also noted the small cavity to the right of the photo, where some softer material had eroded away. 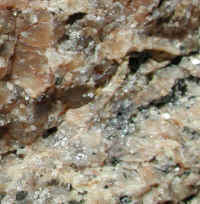 (Photo - 54b) Some of these little crystals sparkle like gem stones. To the left of the photo are some small crystals that form beach sand when they are broken off the rock..
(Photo - 54c) Here are some more of these crystal "gems" in the rock. (Photo - 55) Almost every stone along the beach had some color variations to attract our attention and add to the beauty of our day. (Photo - 57) We climbed back up to the top of the Bluffs and continued our walk along the road until we came to this monument which was in front of the lighthouse. Reading this inscription about the 1590 event reminds us that the evils of human nature never seem to change...someone always wants what another person has. 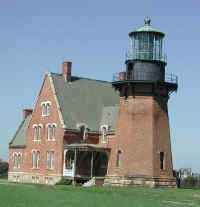 (Photo - 61) A short distance from the monument, we came to the entrance driveway to the Southeast Lighthouse, which was originally erected in 1873 and had a strong enough light to be seen from 21 miles at sea. 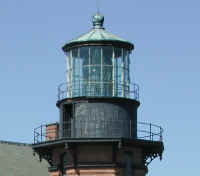 In 1993, due to the eroding of the Bluffs, and the danger of the lighthouse falling into the ocean, the lighthouse was moved farther inland. 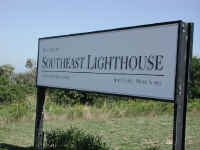 (Photo - 59) This is a photo of the Southeast Lighthouse in its new location. Restoration work has not been completed. (Photo - 58) This photo gives us a closer look at the light, which resembles a giant light bulb. 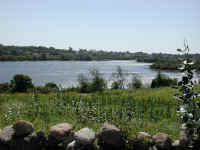 (Photo - 60) This is a picture from the lawn of the lighthouse looking back at a section of Mohegan Bluffs. From here we walked back into town and ate our lunch in a park. After that we took a short walk around town, went back to the airport and flew home. A very enjoyable day!